It is the April race which means we will have some frills as Taco Cabana of Georgetown and the Georgetown Running Club are pitching in and bringing 300 breakfast tacos! This is our 10 year anniversary! Yes, 10 years! Also, Easter is the day after the race, so bring out your Easter/Spring costumes! We are also celebrating all year that the voice of reason was heard and the sewer pipe isn’t going through Berry Springs Park and PRESERVE! Only 3 turns on the certified course. 3.05 miles of paved trail and only 0.05 of cinders. Very fast! Very stroller friendly!! Dogs welcome with their owners on a leash. Held every 3rd Sat at 8am. Please arrive between 7-7:30am to allow for plenty of time to get registered. Race day registration only. Sponsors include: Georgetown Running Club, REI, Georgetown Taco Cabana, No Excuses Running, AdvoCare, and Road ID. 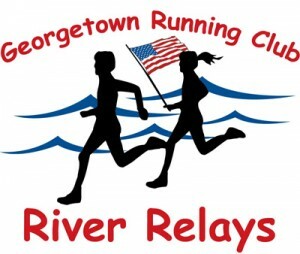 Timed race results posted on-line at the Georgetown Running Club and No Excuses Running websites. Free to students K-12 and $1 for adults. Yes you read that right… FREE to students K-12 and only a $1 for adults. 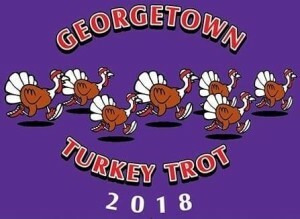 Always FREE to Georgetown Running Club members. Water provided on the course and after you finish. AdvoCare electrolyte replacement fluids after too while it lasts. All proceeds from the race go to Berry Springs Park & Preserve. Welcome and thank you for supporting the Red Poppy 5K that will start at 8am at in San Gabriel Park, Georgetown, TX. The majority of proceeds will be given to Williamson County Children’s Advocacy Center. The center provides a safe place to disclose child abuse, reduce the emotional trauma for children and their non-offending family members, and extend professional services that protect the integrity of an investigation. To learn more visit www.WilcoCAC.org. A portion of the proceeds will go to the Lighting of the Square activities in downtown Georgetown during the holidays. Guaranteed shirt for entries received by 4/3. Those that registered after 4/3 while supplies last. This allows for more money to the charities and not into leftover shirts. If you didn’t get a shirt, check back after you finish the Red Poppy 5k, any shirts not claimed will be given to those that didn’t receive a shirt. We will not be holding shirts after race day pick-up. Thank you for your understanding. 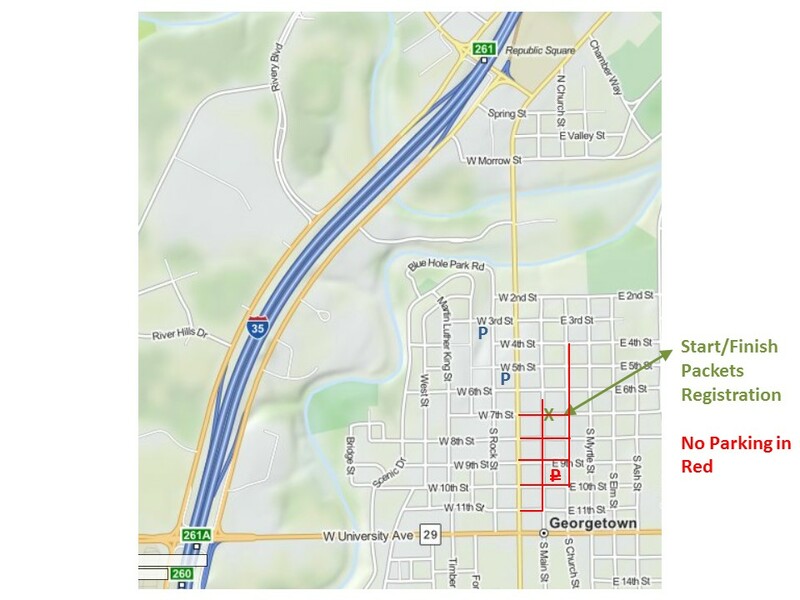 Race Day Parking – 2 parking locations on Lower Park Road (off of E. Morrow Rd). Race bibs should be worn on the front. Chips are in the bib. 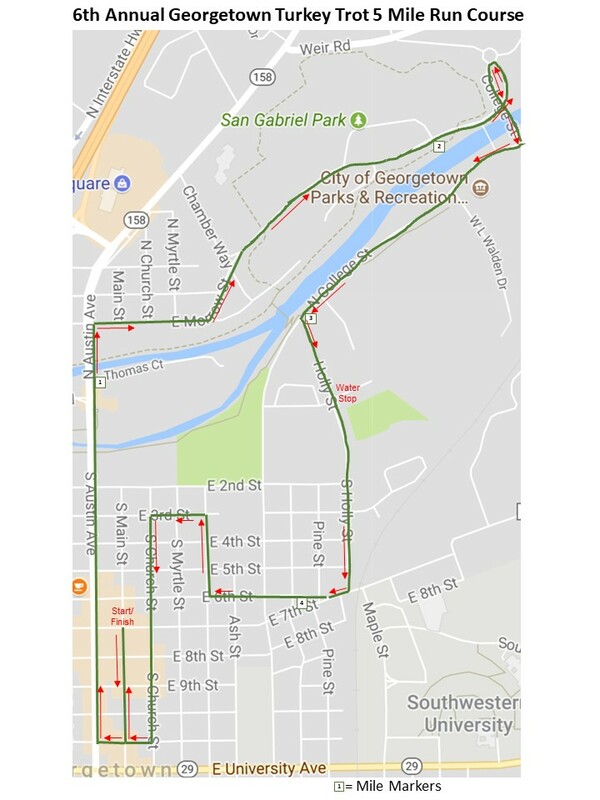 The Red Poppy 5k course is primarily on the paved hike/bike San Gabriel River trail (except the first and last 0.1). It is an out and back course heading towards Rivery Park (location of the water stop), passed the park and the turnaround is just passed the Rivery Rd bridge. Make sure your bib is visible on the FRONT of your shirt. Also, please don’t cross the finish line more than once. Presented to overall male and female finishers, overall masters male and female finishers, and the top three male and female finishers in the following age groups, 10 & under, 11-14, 15-19, 20-29, 30-39, 40-49, 50-59, 60 and older. There will be a Kids’ Fun Run that will be held after the final finisher. The fun run is free but we suggest a $5 donation. All kid finishers will receive a ribbon. We would like to thank AdvoCare. 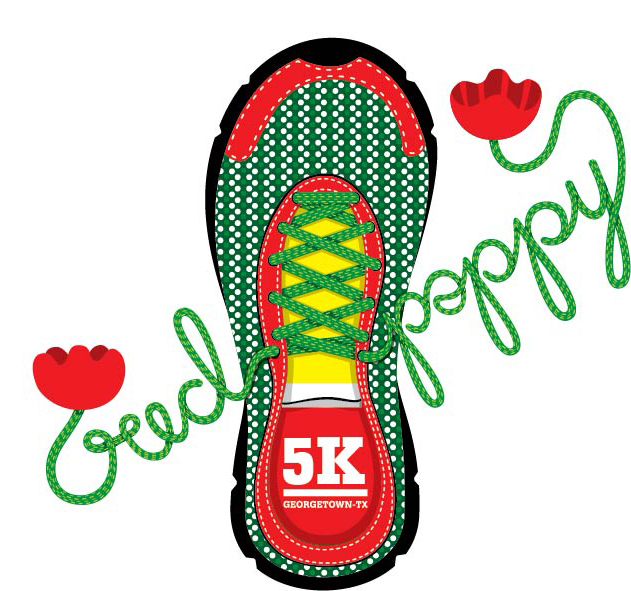 The Georgetown Running Club is hosting the Red Poppy 5K on Sunday, Apr 14th that will start at 8am in San Gabriel Park, 445 E. Morrow St, Georgetown, TX 78626. Challenge your family, friends, and co-workers to come out and run/walk the race. 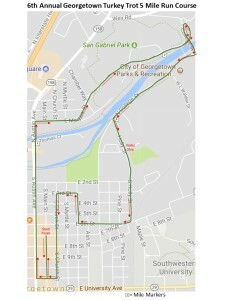 The race will start and end along the San Gabriel River. The race will feature a chip timed 5K run/walk with age group awards, sponsor booths, and tons of fun! Fun course that is ideal for the walker to the competitive runner and everything in between. Great for strollers too!! Yes dogs are welcome, but please keep them on leashes and under control. The majority of proceeds will be given to Williamson County Children’s Advocacy Center. The center provides a safe place to disclose child abuse, reduce the emotional trauma for children and their non-offending family members, and extend professional services that protect the integrity of an investigation. To learn more visit www.WilcoCAC.org. Also proceeds will go to the Georgetown Visitor’s Center. The Red Poppy Bike Ride is not on the same day or location. It is now on Saturday, Apr 13th. 5K participants $25 online, includes a race packet and shirt (guaranteed shirt for entries received by 3/31, after that while supplies last). Entry fee increases to $30 on 4/1. Entry increases to $35 on race day, 4/14. All Georgetown Running Club members receive a $5 discount. Guaranteed tech short sleeve shirt for entries received by 3/31, after that while supplies last, so register before 3/31. You must also pick up your shirt at packet pick-up. No shirts will be held after the event. Register early because this is a highly sought-after shirt and perfect for wearing at the Red Poppy Festival, Apr 27-29 in downtown Georgetown. There will be a Kids’ Fun Run that will be held after the final finisher at around 9:15. The fun run is free but we suggest a $5 donation. All kid finishers will receive a ribbon. Presented to top overall male and female runners, top masters male and female, and the top three male and female in the following age groups, 10 & under, 11-19, 20-29, 30-39, 40-49, 50-59, 60 and older. We would like to thank AdvoCare and Georgetown Parks & Recreation. 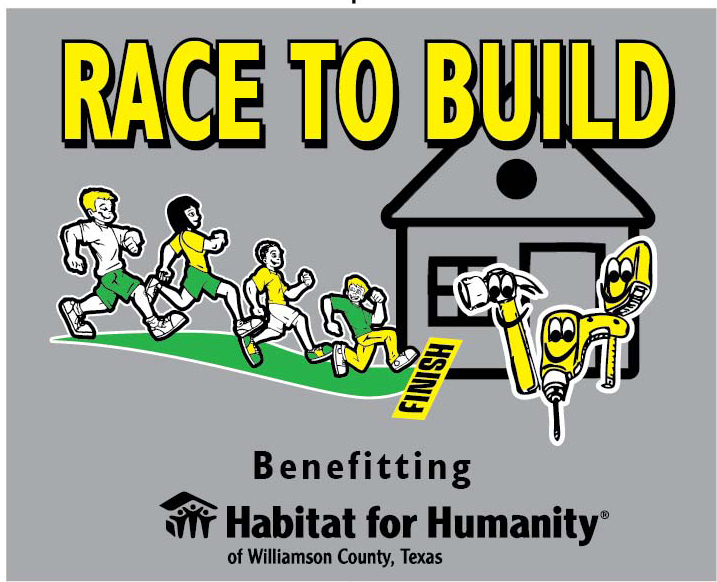 Thank you for supporting Habitat for Humanity of Williamson County and Williamson County Parks & Recreation by participating in the Race to Build 10k or 5k Trail Race on Sunday, March 17, 2019. The race is being put on by the Georgetown Running Club (GRC). Before getting into the details of the race, it is important that you understand that this is a trail race on rugged, natural trails. These are not cinder trails that are in other areas of this park. You will encounter loose rocks, permanent rocks, dirt, leaves, sticks, tree branches, cactus as well as other natural obstacles and possibly wildlife. The GRC and park have done our best to remove the high grass, but don’t let this fool you into thinking the trail is a well maintained, groomed trail. Running strollers will not be allowed on the 10k Course 2019 because the trail is not wide enough in spots or suitable for them. 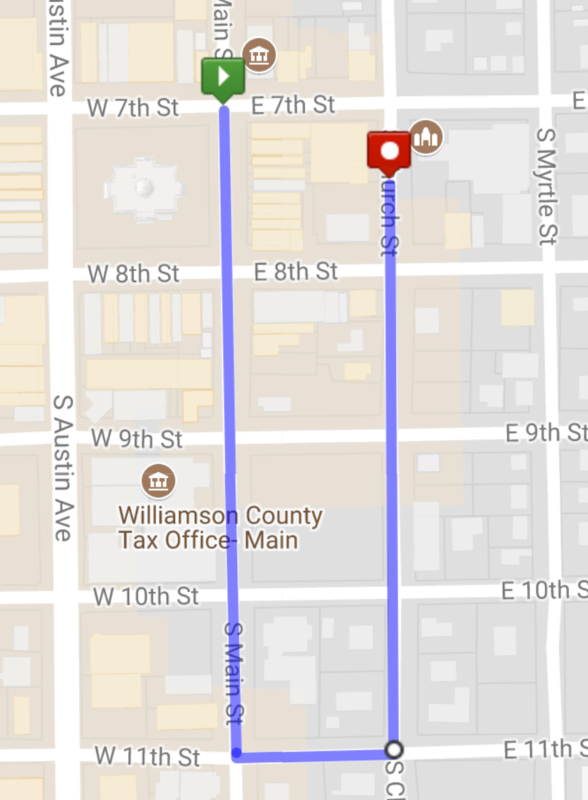 Running strollers are allowed but not recommended on the 5k Course 2019. This is for the safety of not only the person in the stroller but those on the course. Dogs are also not allowed during the race. 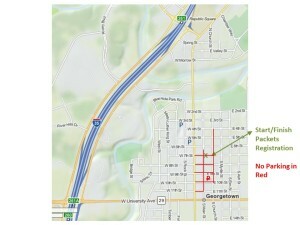 The 10K will start at 8:30am followed by the 5K at 8:45am. Bibs should be worn on the FRONT. Both races are chip timed events. There will be on-site results as well as live results on-line provided by Event Data Solutions. The race will happen rain or shine. It is a trail race, so the more mud, the better. Only lightning will postpone or cause cancellation of the event. If you want to stay up to date on announcements, then join the Race to Build 5K & 10K Trail Race Facebook event or check back here. Race starts in the disc golf parking lot at Southwest Williamson County Regional Park. 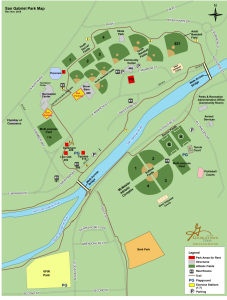 Parking for participants will be in the stadium, tennis courts, and soccer field parking lots. Please follow directions by the volunteer parking directors. There will be portable toilets located in the disc golf parking lot within 100m from the start/finish line. If you prefer indoor toilets, they are located at the stadium (400m from the start/finish line), tennis courts (700m away), and softball fields (800m away). Plan accordingly. If you would like to volunteer or know of others, please check-out the sign-up list. Guaranteed shirt for entries received by 3/3, after that while supplies last. If you registered on 3/4 or later then come to packet pick-up early to improve your chances of getting a shirt in your desired size. You must also pick up your shirt at packet pick-up. No shirts will be held after the event. There will be a Kids’ Fun Run that will be held after the final 10K finisher. The fun run is free but we suggest a $5 donation. All kid finishers will receive a ribbon. Presented to top overall male and female runners, top masters male and female, and the top three male and female in the following age groups: 14 & under, 15-18, 19-29, 30-39, 40-49, 50-59, 60 and older. We would also like to thank our other race sponsors: CarMax, Georgetown Parks & Recreation, and No Excuses Running. Georgetown Running Club especially thanks CBS Austin for their partnership in promoting running in Williamson County and the Georgetown area. Challenge your family, friends, and co-workers to come out and run/walk the race. The race will start and end in the parking lot of the disc golf/trail entrance parking lot. The race will feature a timed 5K run/walk with age group awards, sponsor booths, and tons of fun! Challenging 10K course that is on the trails in WILCO Regional Park. The 5K course is an out and back trail race that is mostly flat. Due to the difficult terrain on the 10k course running strollers will NOT be allowed on the 10K course. This is for the safety of not only the person in the stroller but those on the course. 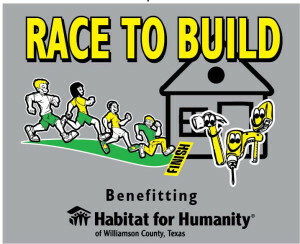 Proceeds from the race will be donated to Habitat for Humanity of Williamson County, Texas and Williamson Parks & Recreation. The 10K will start at 8:30AM followed by the 5K at 8:45AM. This will be a chip timed event this year. There will be on-site results as well as live results on-line. 5K & 10K participants $30 online, includes a shirt (guaranteed shirt for entries received by 3/3, after that while sizes & supplies last). Entry fee increases to $35 on Jan 7, $40 on Mar 4th and $45 on race day, Mar 17th. Guaranteed shirt for entries received by 3/3, after that while supplies last, so register before 3/3. You must also pick up your shirt at packet pick-up. No shirts will be held after the event. 14 & under, 15-18, 19-29, 30-39, 40-49, 50-59, 60 and older. Vern’s No Frills 5k is held on the third Saturday of every month at Berry Springs Park & Preserve, 1801 CR 152, Georgetown, TX. Sponsors include: Georgetown Running Club, REI, Luke’s Locker, Georgetown Taco Cabana, No Excuses Running, AdvoCare, and Road ID. Water provided on the course and after you finish. AdvoCare electrolyte replacement drink after too while it lasts. All proceeds from the race go to the Williamson County Parks & Recreation. Vern’s No Frills 5k is held on the third Saturday of every month. Welcome and thank you for supporting River Relays 5k that starts at 8am on Sunday, July 22, 2018. The Georgetown Running Club is a nonprofit organization whose mission is to promote and encourage running, walking, and fitness in the community and to provide competitive and non-competitive activities for its members and the general public. Each team member will run counter-clockwise 1 loop (1.55 miles) of the San Gabriel Trail. There will be water and AdvoCare at the race start and finish. As well as bagels and bananas. If we get volunteers then there will be course monitors at both locations that cross the park road, but please use caution as the road is NOT closed to traffic. Only the 2nd runner on each team should be wearing a number. A 5k time for the team will be tracked but it is up to you to time each person if you would like to know your splits. When the 2nd runner finishes they will be handed a finish card. Make sure you give that to a finish line volunteer. Guaranteed shirt for entries received by 7/9. Those that registered after 7/9 while supplies last. We will not be holding shirts after race day pick-up. Thank you for your understanding. Parking is only allowed in marked parking spots. Best to park at the river parking lot. 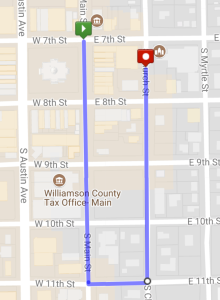 Take Chamber Way off of Austin Ave. Go to the end and turn right and the first left into the new parking. Drive to the left and you will see the river parking lot. There is a restroom near the parking lot. 13 award categories and will follow the final finisher. We will have a bulletin board to post results. Remember the top 3 in each category win an award. 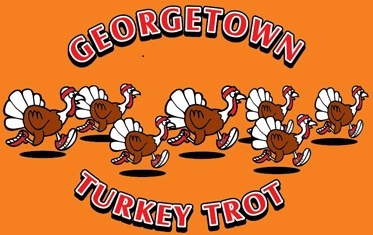 Georgetown Turkey Trot 5 Miler, Thu, Nov 22nd in downtown Georgetown at 8am. Race to Build 5k & 10k Trail Race, Sun, Mar 17th at WILCO Southwest Regional Park at 8:30am. Red Poppy 5k, Sun, Apr 21st at San Gabriel Park at8am. Vern’s No Frills 5k is every 3rd Saturday at Berry Springs Park & Preserve at 8am.